I’ve really enjoyed exploring this question type (although, I have to admit, never yet with children as young as Y3). 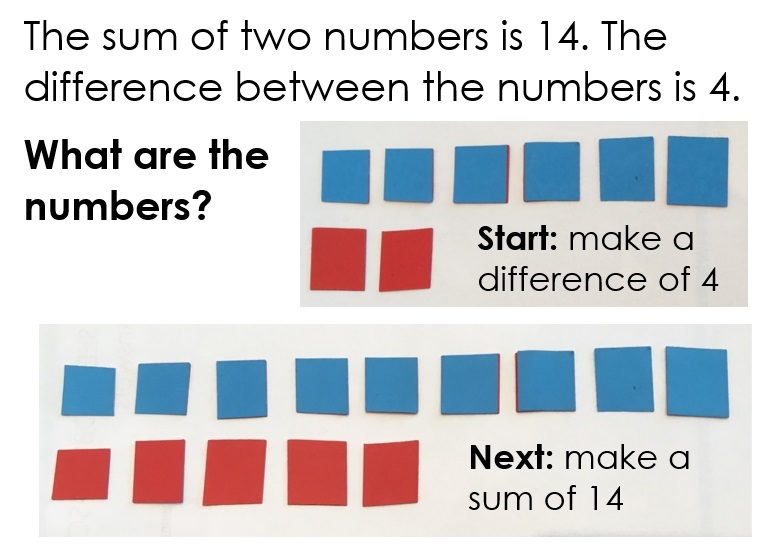 I want children to see and feel the structure of this type of problem, building up to being able to answer a question like the example above in small steps. Then, by working through a series of related questions, children will learn how to use efficient problem-solving strategies. They will also come to see that questions with different ‘surface features’ can have a very similar mathematical ‘deep structure’. 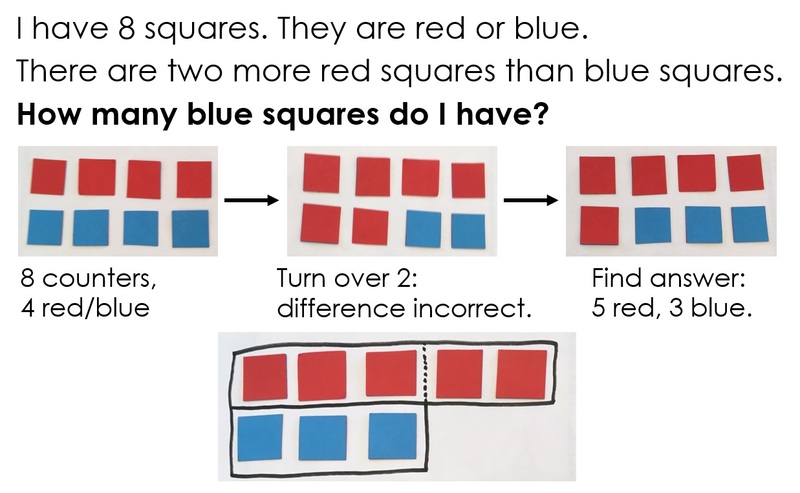 Often, children start with 8 counters – 4 red, 4 blue. Then, they turn over two blue counters. They realise (with a nudge) that the difference between the number of red/blue counters is incorrect. With a bit more cajoling, we see only one counter needed turning over. At this point I line the counters up above/below each other. I suggest, rather than starting with the correct number of counters, we could start with the correct difference. Have 2 more red counters than blue counters; keep adding a red & blue until you have 8 counters. This time, many children start by laying out four blue counters. We note that ten more counters are needed (5 blue, 5 red). Other children get 14 counters and experiment with how many to turn over. We look at these different approaches. Then, I draw a bar model around the counters (like for the original example), drawing a dotted line to highlight the difference of 4 counters. Having shown that the difference between the prices is 10p, the cost of the rubber can be calculated by halving 30p (a common incorrect answer to this question is pencil=30p, rubber=10p). Here’s another lesson example of how to break down the problem-solving process. 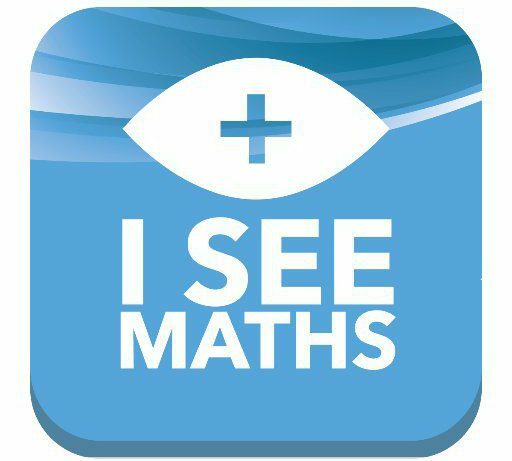 I See Problem-Solving – UKS2 is designed to give teachers the tools to teach problem-solving systematically too. Work will start on the LKS2 version in January 2019. I can’t wait!